Home / Index category / Jonas Kallman to play for Swedish IFK Skovde HK! Jonas Kallman to play for Swedish IFK Skovde HK! One of the most important players in the system of Talant Dujshebaev during last decade in BM Ciudad Real and BM Atletico Madrid, Swedish left wing Jonas Kallman (32) is back to his native team – IFK Skovde HK! 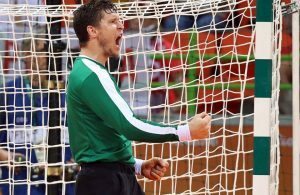 The tallest left wing in the world of proffesional handball, 200 cm tall Jonas decided to get back at the domestic stage. He went from Skovde to Spain in 2002, where he played last 11 years with all the success of his team until this summer and financial collapse of MAdrid’s team. Kallman was one of the most important players in fantastic success of Swedish handball – Olympic silver medal in London 2012. Next Story → Which HANDBALL STORY in August made the biggest impression on you?